excessive use of synthetic fertilizers in India is reducing soil fertility and affecting food production, said a joint study by non-profit Greenpeace and West Bengal's Visva Bharati university. The study was released on June 30. Data quoted by the study said in the 1960s there was a 25-kg increase in grain production with each kilogramme increase in the use of fertilizers. In the early 1990s this yield response decreased to 17 kg; it declined to 8 kg in the late 1990s. The report titled Subsidising Food Crisis said micro-nutrients in the soil is lost with overuse of common nitrogen fertilizers like urea that accounts for 82 per cent of the total fertilizers used in India.Eighty-two per cent of the farmers surveyed in seven large agricultural states in the country said they were ready to use bio-fertilizers if they are easily available and subsidized. 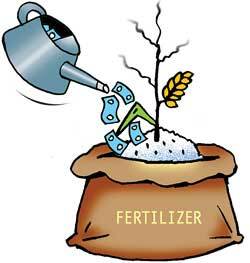 The fertilizer subsidy as of now is Rs 1,20,000 crore as against Rs 60 crore in 1976-77. "If India withdraws subsidies from synthetic fertilizers in a phased manner over five years, it will save Rs 12,000 billion," said co-researcher for the study, Reyes Tirado at the Greenpeace Research Centre in the University of Exeter, UK. She said if 40 per cent of that saving is invested in vermi-composting units it would be possible to shift to organic nitrogen fertilization. Yudhvir Singh, president of the Bharatiya Kisan Union said fertilizer subsidy should be given directly to the farmers who should decide what fertilizers to use. The fertilizer industry too does not want subsidies on synthetic fertilizers though for different reasons. "If our production cost is Rs 100 a kg, we have to sell at Rs 20. The balance payment comes from the government very late and we end up losing," said Satish Chandar, head of Fertilizer Association of India.